What are all the cool kids playing on their consoles today? Katamari Damacy! It's the sort of game that only comes along once every few years, where the controls, theme, and tone all coalesce perfectly to create a kind of Platonic gaming mood. Katamari Damacy is a Namco release for the Sony Playstation 2. The plot is a tissue thin excuse to justify the madness. Your father, the Lord of All Creation, got drunk and accidentally destroyed all of the stars in the sky. Your job is to go to Earth and roll around a small ball, called a katamari. Anything smaller than the katamari sticks to it. As more and more objects stick to it, the katamari gets bigger, and can pick up more items. So you'll start off the size of a thimble, able to pick up things like thumbtacks, chessboard pieces, the occasional butterfly, and the like. As you grow, you'll be able to pick up larger and larger items -- teapots, small dogs, children, people, bicycles, cars, islands, and so on. After each level, you're graded on your performance and, if you collected enough stuff your katamari (and everything it picked up) is turned into a star. The best thing about the game is it's simplicity. There's basically one rule: if it's smaller than you, it sticks, and if it's bigger than you, you bounce off (possibly knocking parts of you off). Likewise, the controls are elegant. No buttons are absolutely necessary to play: just use the two thumbsticks, and drive like a tank. Push both forward, and the katamari rolls forward. Pull them back, it rolls backwards. Push one stick forward and the other back, and you turn. There's initially some emotional guilt the first time you pick up a mouse, or a kitten, but soon enough you are lost in the sheer joy of it, and you're gleefully chasing a shrieking Mrs. Tanaka down the street on the way back from her grocery shopping. Amusingly, the game also gives you a brief description of every object you pick up, and a biography of every person you ruthlessly murder reunite with the cosmos. Visually, the game is whimsical and charming, without being cloyingly sweet. It's pretty clear that hallucinogens played at least an inspirational role in the game's design. Lines are crisp and cartoony, with a rich and varied palette, polygons are blocky in a Fisher-Price sort of way. It's clear that Toy Commander for the Dreamcast was a big influence on the developers. The problem with Toy Commander, though, was that it was much too difficult. Katamari Damacy imports the best parts of that earlier game, and leaves the hugely complicated game mechanics at the door. The mechanisms of the game itself also suggest Atari's Marble Madness at times, although this is a much more chaotic, open-ended, and less abstract game than that arcade puzzler. The reason the simple controls work so well is that the gameplay is so subtle. The fact that your katamari changes in scale during each level is transformative in and of itself. So in the early parts of a level, larger objects are effectively obstacles, and serve to delineate the landscape in which you move. By the time you've tripled in size, you can simply roll over them and absorb them. In this way the landscape manages to be dynamic even when no objects in it are moving. Effectively, you're playing in four dimensions. The soundtrack is infectious and simple. The starting theme song (listen to a brief sample here) has been lodged in my brain all day (only being driven out when I occasionally play The Girl from Ipanema). There's a variety of other songs in the game itself, and if there's a soundtrack album, I'm buying it. The music is eclectic, jazzy, infectious, and perfectly appropriate. Here's another brief sample for your enjoyment. 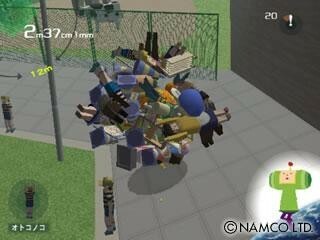 Lastly, one of the best aspects of Katamari Damacy is that it is available, retail, for a mere $20. (I guarantee you that someone at Namco, right now, is kicking themselves repeatedly). At that price, there's no excuse to not get it if you have a PS2. Many of the strangest Japanese games don't make it to the US market. I'm hoping that the wild (and perhaps unprecedented) success of Katamari Damacy is the thin edge of a wedge that opens us up to more strange and delightful things. American publishers and distributors, take note. Ron Gilbert (yes, that Ron Gilbert) has an excellent review of Katamari Damacy where he reveals that it is all a metaphor for our capitalist consumer economy. And, if I may digress, as long as you're at Grumpy Gamer you should also read his insightful and interesting analysis of the costs of producing and selling a 2D adventure game in today's marketplace. Toy Commander was an extremely innovative (and much too difficult) game for the Sega Dreamcast. From the title, I thought this was going to be another foodie post, about Regency English squid dishes. But now I would really like to try this game. I don't suppose there's a snowball's chance they'll release a PC version? hit on their hands, they might port it to GameCube. I hope it gets ported to something. I don't really want to have to buy a PS2 for this. But hey, with this and Ico and some of the pretty platform games, maybe it's worth it to cave and end up owning all three goddamn consoles. That's kind of funny, I was just thinking about getting an X box to complete my trifecta of consoles! in my country we have not masetr card or another cardes. how i can join to this site or another? I've played this game and it is pure god's work. I had a house full of people flipping out to play it. It is the weirdest experience you will ever have. Great controls and the strangest graphics ever brought to U.S. grounds. By the way Tripp, I've been considering the same thing too. I may break down soon and buy an Xbox. They've finally got more then 5 original titles that aren't being ported that will make it worthwile. this game seems to be the work of either a group of genuises or a bunch of stoned japanese guys. either way, it's absolutly incredible. bought this game for 20 bucks which i would have paid for the soundtrack anyway, but on top of that i got this incredible game. i have one question....does anyone know the title of the song that sounds like it's by some unknown lounge singer? That song would almost certainly be "Que Sera Sera," by Asuka Sakai and Charlie Kosei. This game by itself is justification to chip a Playstation to play imports. I was just reminded by the Boing-Boing post that there was a person in a Katamari Damacy costume at Baycon in San Jose last month. She (He? It?) was even rolling around a ball that people taped random things to. If it wasn't for Tea Leaves I'd have been clueless.